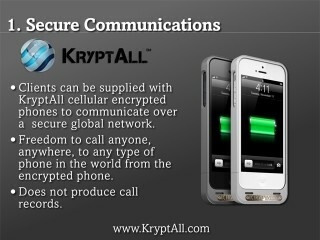 Clients can be supplied with KryptAll cellular encrypted phones to communicate over a secure global network. Freedom to call anyone, anywhere, to any type of phone in the world from the encrypted phone. Does not produce call records. Digital dashboard to proactively protect family & corporate assets.